Catalhöyük (Turquie): The Earliest Representation of a Volcanic Eruption? 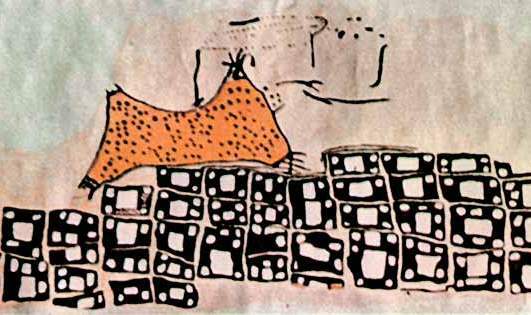 In the early 1960s, archaeologist James Mellaart uncovered a mural at Catalhöyük, the world’s largest and best-preserved Neolithic site, which he interpreted to represent a volcanic eruption. Fifty years later, scientific tests done on pumice at the nearby volcano Hasan Dag confirm that there was, in fact, an eruption between 9,500 and 8,400 years ago - a timespan including the era that the mural was likely painted. 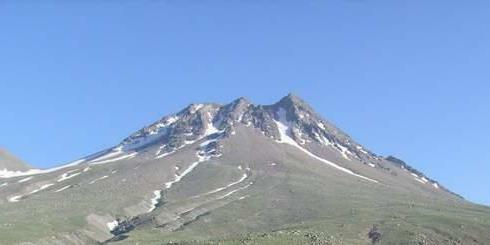 The eruption of the volcanic peak at Hasan Dag may be represented on a Neolithic mural at Catalhöyük. Over the past two decades, prominent excavations at Catalhöyük, under the direction of Stanford archaeologist Ian Hodder, have greatly expanded our image of the Neolithic proto-city. A recent study conducted by volcanologist Axel Schmitt of the University of California in Los Angeles has returned attention to Mellaart’s volcanic mural. The ochre-painted mural has been given a range of classifications over the years; those that see the peaks of Hasan Dag looming over a Neolithic village have described it as the world’s oldest extant landscape scene or map, whereas skeptics have dismissed the theory, suggesting that the abstract shapes could instead represent a range of subjects, including a leopard’s skin. At a Geological Society of America conference held on October 30, 2013, Schmitt presented new evidence of a small scale eruption at Hasan Dag. Using uranium-thorium-helium dating in zircon crystals, Schmitt revealed that the volcanic deposits match the mural’s chronology and depiction of a minor volcanic flare, resembling what is known as a Strombolian-type eruption. Obsidian, a sharp volcanic glass, formed a dominant part of the lithic industry at Catalhöyük, and the proximity of volcanic sources for the valuable Neolithic commodity shaped the site’s material culture. Catalhöyük residents made tools of obsidian by flaking the black volcanic glass into razor-sharp knives and blades, and used the material to form an even more surprising artifact type: mirrors. Obsidian fragments were cut into semi-hemispherical shapes and carefully polished until a reflection was visible. Mellaart discovered eight obsidian mirrors at the site - the earliest ever found. Volcanic obsidian is one of the trademarks of the Neolithic material culture at Catalhöyük, and the recent volcanic studies may indicate that the residents had a collective memory of the creation of one of the sources of their valuable commodity.